It is a rare recipe that I use and follow just as it’s written. Normally, I make all kinds of tweaks with ingredients, amounts, additions, etc. However, this gluten-free Chocolate Almond Butter Cake recipe from the Whole Life Nutrition Kitchen is perfect just as it is. It’s a rich and tasty, satisfying and healthy bit of chocolatey goodness, and incredibly easy to boot! If you’re not familiar with their blog, it’s a terrific resource for gluten-free cooking. And to encourage you to check them out, click here to go directly to their blog in order to get the recipe for this awesome cake. The only change I made was to do a coconut milk & whiskey sauce drizzled on top. Enjoy! 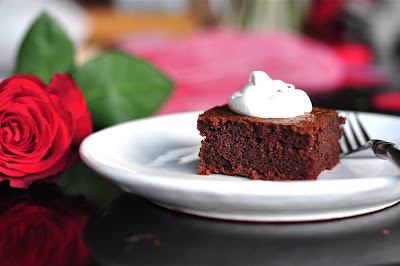 This entry was posted in Desserts, Quick and/or Easy, Recipes and tagged Chocolate, dessert, Gluten-Free, Vegetarian, whiskey sauce by Brooke Bonner. Bookmark the permalink. thanks for sharing! It looks great, doesn’t it?